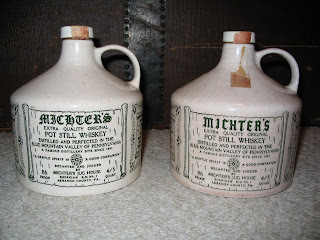 The other day when I was up towards Michter's, we stopped in town at the local antique store. The guy has an awesome collection of decanters, bottles, and signs for sale. All reasonable priced and in mint condition. I picked up 2 really nice jugs. The beginning of my collection! Once I get a free weekend, I plan on calling the owner of Michter's to arrange a tour of the place. I plan on asking him his intentions for the property and maybe even offering to mow the place once in a while or something.